Featured: Light Up riverside is Tomorrow! ; Accessibility Ramps Delivered Last Week!, What’s ON for Shop the Neighbourhood Tomorrow! BIA Notices/Reminders: Window Wonderland is Kicking off Tomorrow; Have you applied for the Digital Transformation Grant? Neighbourhood News: Corktown History: Book Launch; Transit & Toronto Trivia Night from TTCriders. Light Up Riverside is tomorrow! NEW Accessibility Ramps in Riverside! Riverside is looking Brighter! 8 BRAND NEW accessibility Ramps have been delivered last Friday, Nov 16th! Riverside received 8 brand new accessibility ramps! Thanks to the partnership between LoyaltyONE and StopGap Foundation, Riverside businesses got the chance to receive a custom-made StopGap ramp for free! There were so many great ramps that even the CityNews made a video about Riverside’s ramps!! Check all of them here on our blog post! Shop the Neighbourhood is tomorrow! Right on time for your Holiday shopping! To kick off the holiday season, Riverside establishments will be opening their doors and inviting everyone for meet and greets and special happenings on November 24th! 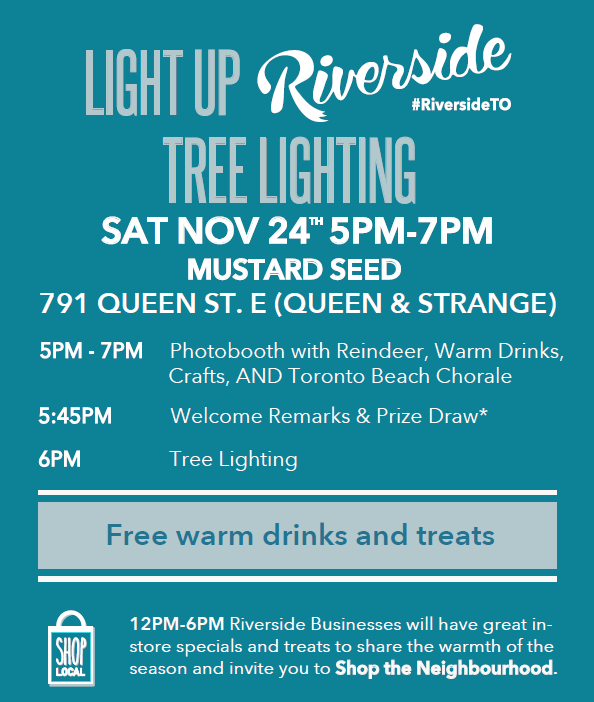 A number of fun and festive events will take place throughout the day along Queen Street east from the DVP to Empire Ave, culminating in Light Up Riverside tree lighting and cheer event (5-7pm, 791 Queen E). Don’t miss the chance to be part of a day of cheer! The BIA is inviting everyone for meet and greets, treats and special happenings to help ring in the holidays! Check all the specials here. Window Wonderland Contest starts tomorrow! Window Wonderland Contest is kicking off tomorrow! We’re already delivering posters for the businesses! If you didn’t get one, send us an email at marketing@riverside-to.com! Have you applied for the Digital Transformation Grant? Businesses located at the Riverside BIA are eligible for $2,500 grant to improve their Digital Presence. Applicants will access the grant process through the Grant Program Portal, which is available until next March, but only 2,000 grants are available! You can use these funds in many ways, as long as it applies to your digital plan!! It can be used to improve social media, create a mobile-friendly website, advertise to current and potential customers, or develop email newsletters! All members from the Riverside BIA are eligible to receive a $2,500 Digital Main Street Digital Transformation Grant from the Government of Ontario. TTCriders is a grassroots advocacy organization that represents Toronto’s 1.8 million transit riders. We campaign for an affordable, world-class public transit system, and believe everyone has the right to use fast and reliable transit at an affordable price. At the trivia night, you’ll have a chance to win great prizes including a $750 VIA Rail voucher, learn about our plans for the year ahead, and support our work for affordable public transit. Hosted in partnership with the Ontario Heritage Trust, join Coralina R. Lemos, author,in the launch of her book: CORKTOWN – The History of a Toronto Neighbourhood and the People Who Made It. In this first book written on the area’s history, Lemos shares her knowledge of the neighbourhood and solid research, pieced together and reconstructed with relevant stories that highlight people, establishments, and institutions that helped to shape this historic community. Monday, Dec. 3, 2018 at Enoch Turner Schoolhouse, doors open: 6:45 p.m.